Quite a while ago I got my first request for a future article. 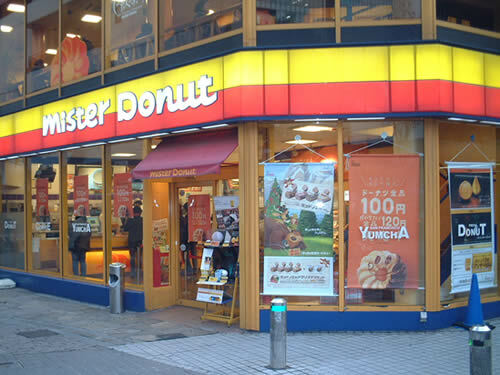 A fan of mine wanted to see a report on Mister Donut in Japan seeing as how they've mostly disappeared in North America, but are everywhere in Japan. 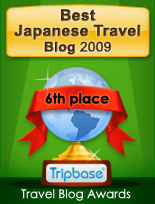 The article was in the works when along came Krispy Kreme, opening it's first ever shop in Tokyo about a month ago. The timing couldn't be better for a battle to the death! I'm not a huge doughnut fan, but I have been to Mister Donut a few times, so I know what to expect from them. Krispy Kreme was an entirely new experience for me though. I'd only heard of them a few times but never set foot into a shop. So what's important when choosing a brand? Let's analyse some facts shall we? Here we have a Mister Donut shop. You can always expect quite a few people to be lining up inside buying doughnuts here at all hours. Maybe you'll have to wait about 5 minutes. At Krispy Kreme, the line up was out and around the building. Another crazy Japanese lineup. Wait time was about 1 hour. Round 1 to Mister Donut. Krispy Kreme let's you watch the doughnut making process! 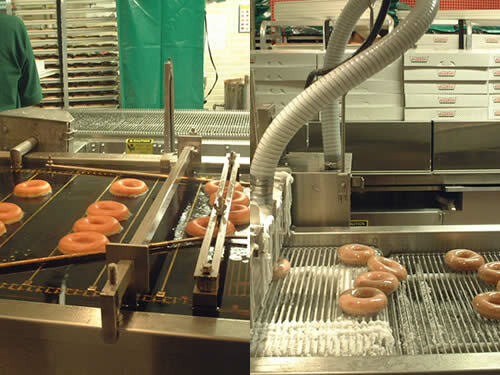 What fun to watch the doughnuts float down the river of oil, then through the sugar coating machine, etc. No false advertising here! 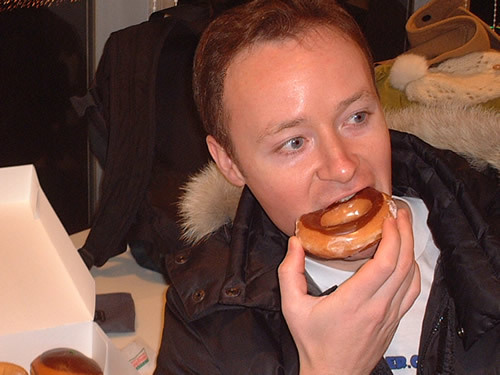 You know that your doughnut is an oil soaked, sugar filled, fattening piece of cholesterol, and you don't care! 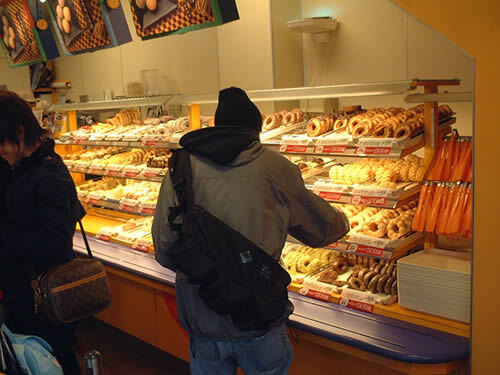 Krispy Kreme in Japan currently only offers 14 different kinds of doughnut. 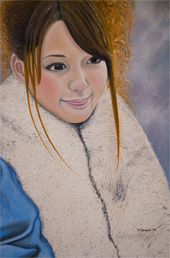 Seems paltry but wait. The flavours are all REAL flavours, not silly Japanized ones. How long has it been since I had a lemon filled doughnut? Nice. Round 2 to Krispy Kreme. Here's 6 of the most normal Mister Donut's doughnuts I could find. Hmm, I guess they look pretty good. A doughnut is just a doughnut after all right? 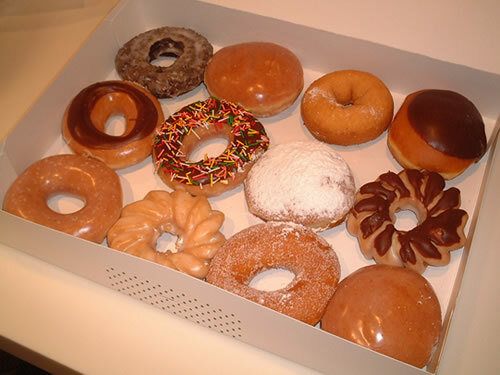 And here's a dozen of Krispy Kreme's. Damn, is it me or are these doughnuts just glowing with the anticipation of making me happy when I bite down on them? 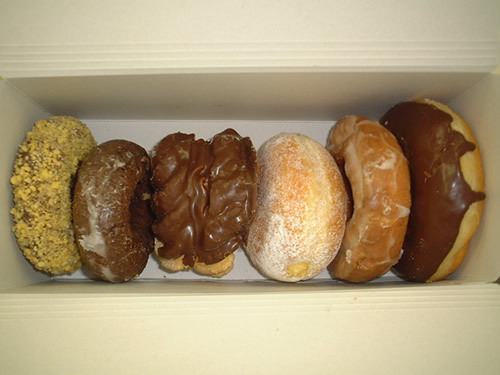 Compared with Krispy Kreme's selection, Mister Donut's doughnuts look like a bunch of stale old crap! Round 3 to Krispy Kreme! -Krispy Kreme spells the word 'doughnut' correctly. Not only that, they use the plural form unlike Mister Donut which uses the singular. I don't want one doughnut, I want doughnuts fools! -Mister Donut boasts the World's best coffee and gives you free refills. Well I never tried it, but anyway we're talking doughnuts here, not coffee. 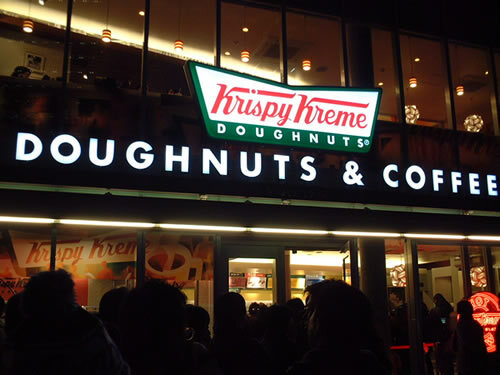 -Krispy Kreme gives you a FREE doughnut just for standing in line! Don't know how long that will last though. -Mister Donut puts a little sticker on their bags and boxes that says 'thank you, you beautiful people'. A 'pick me up' if nothing else. 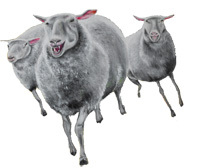 Ok, but enough fooling around. We all know that when it comes to doughnuts the most important thing is TASTE! Final round! Remeber I said it was my first time ever at Krispy Kreme? My friend Jason came with me and the whole time was extolling the virtues of Krispy Kreme. Nothing will prepare you, nothing even comes close! He told me. He scorned Mister Donut as 'swill', but I was sceptical. I mean how good could a doughnut be? It's just fried cake right? And hey, Mister Donut isn't that bad! History being made! Turns out Jason was right and that in truth, nothing will prepare you and yes, no other doughnut comes close, AND Mister Donut is that bad. I just can't put into words the heavenliness of my first Krispy Kreme donut. It was fresh! It was soft! It didn't crumble apart! It was like eating a soft, warm piece of love. Krispy Kreme wins by a knockout! See ya later Mister Donut!